Licensing and publishing promo samplers are put together by music publishers (who are responsible for ensuring the songwriters receive payment when their compositions are used commercially) with the aim of making an artist's work known to potential clients such as advertisers or music directors working in the film/tv industry. 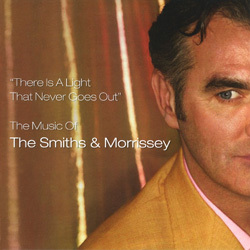 This 2-cd package put together in 2004 features one cd of Smiths music and one cd of Morrissey music. Each cd features 12 tracks, from obvious classics to lesser known album tracks. The front and back artwork are variations on the artwork of Morrissey's solo single "Irish Blood, English Heart" (view front artwork). Track listing: "Boxers", "Irish Blood, English Heart", "Everyday Is Like Sunday", "The More You Ignore Me, The Closer I Get", "You're The One For Me Fatty", "Now My Heart Is Full", "First Of The Gang To Die", "Hold On To Your Friends", "We Hate It When Our Friends Become Successful", "I Am Hated For Loving", "Suedehead", "You Know I Couldn't Last". For Smiths track listing, see here. This sampler features music by various artists having worked with producers Clive Langer & Alan Winstanley, including Morrissey whose 1989-1991 material was produced by the latter team. Morrissey content and year of production unknown.